I posted a similar deal recently, but there is a new Kraft coupon available, so if you missed out last time, make sure to go ahead and print your coupon for $1.50 off Kraft Recipe Makers. 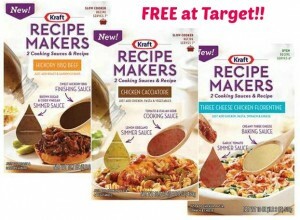 You can get (2) FREE Recipe Makers at Target with the coupon and the B1G1 Sale! These sauces are delicious and an easy meal that the family will be sure to enjoy. If your Target does not allow a coupon on the free product (some won’t) then you’ll get both for 99¢ each with one coupon. The sale is good through 11/2.